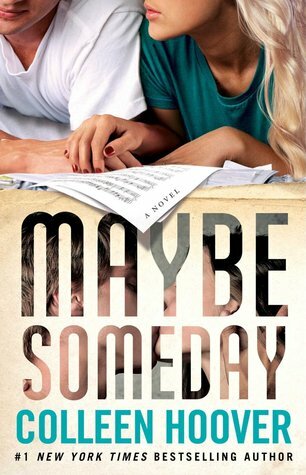 Maybe Someday was about Sydney whom her boyfriend was cheating on with her best friend, resulting her with swollen hands because she punched them both and nowhere to stay for the night. Her deaf guitarist neighbor, Ridge, was kind enough to let her be his roommate as long as she helps him with his writer's block. First off, the characters are amazing. They are so realistic and down-to-earth yet very witty with their sarcasm, sassiness and the right on point humor. Plus, I love that Colleen Hoover gives us characters with disabilities, it's very eye opening. However, the characters are way too emotional, in my opinion, especially Sydney, she basically cries whenever her heart races a little more quickly than usual. One more thing, I didn't like Ridge towards the end of the book, it was almost like he changed into another person ,and I don't think I liked that 'growth'. Also, I don't feel like I know the characters all that much, yes, we were given background stories but it wasn't enough, though that didn't lessen how entertaining this book was. As for the writing style, it didn't click with me at first, I don't know why. It grew on me later and I flew through this book in a day nonetheless. I like her recent release, November 9 much more, writing style-wise. The ending was amazing, just swoooooon. Anddddd, the fact that this book focuses a lot on making music and stuffs, and that they actually recorded soundtracks for it is just nandhaiuwheija life and everything. “I failed miserably at trying not to fall in love with you. Overall, I gave this book a 4/5 stars. It was a quick romantic read and I definitely recommend it!